tonight i’m keeping things nice and simple with a salad, chili and brown rice. 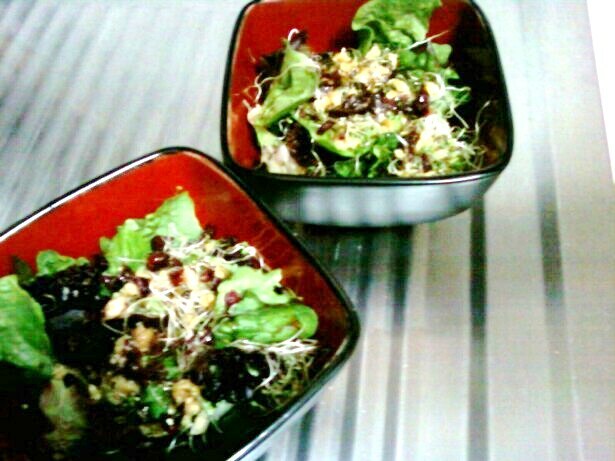 heirloom lettuce, sprouts, walnuts, cranberries and vegan parm. 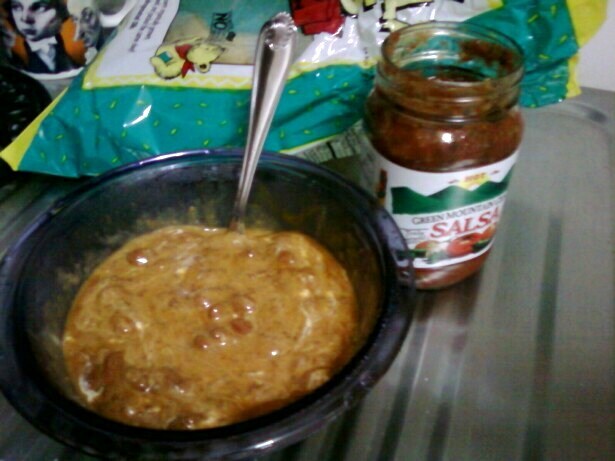 i use the 365 (whole foods) spicy one, heat it up, and put a nice dollop of veganaise on, and mix it in. i know it sounds weird, but it’s totally good, and gives it a wonderful creaminess. the leftover cornbread will be happy to get involved here too. i ate some with chips & salsa too! brown rice, oh how i love thee! nothing beats some nice, clean, brown rice. in macrobiotics, brown rice is super important because it is considered the perfect food to bring you into balance. and who doesn’t need some balance? i ran out of it over a week ago, and the last week was kind of crazy, so it’s probably a good idea to make a nice sticky sweet batch… right now! bring to boil, stir, and drop to low to simmer, covered for at least 40 minutes. i like to check on it at 40 minutes and see how it’s doing. see how much water is left in there. this usually coincides with the time where you really begin to smell the rice. then you can monitor it, depending on how you like your rice. i don’t like it too mushy, so i tend to take it off at about 45 minutes, even though my rice bag says 55 minutes. it also depends on your stove, (you may need to add a little more water if the burner runs hot/high) so be sure to check it earlier so you don’t burn it to the bottom of your pot. once you know your stove/burner/preference, it’ll be auto-pilot. a lot of people get inpatient with the whole 40-55 minutes thing. really, it’s no big deal. put it on right before you do something like: take a shower, watch a show, cook something else, and you’ll see it’s ok. look, you’re even multi-tasking!